I started my career with Bradley’s in January 2018 at the St Thomas office. I have lived in Exeter for my entire life and will therefore be able to provide a good level of local knowledge. During my time at college, I had a part time job at Jack Wills University Outfitters, which later developed into my full-time job as a supervisor, and allowed me to develop a great level of customer service. 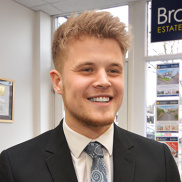 I soon grew a love for estate agency after learning more about it through my father who has been an Estate Agent since 1989. During my spare time I am a huge football fan who has a strong love for Liverpool FC. I’ve also been playing football ever since I can remember and have found myself playing for teams such as Devon School Boys, Heavitree united and Clyst Valley.